Vanilla Ice's "Ice Ice Baby"
Ice Ice Baby was one of the most successful tracks of the early 1990s. It has become one of the most derided songs of all time, regularly topping "worst songs of all time" lists. To be fair, it sounds pretty good. Because the song blatantly rips off Queen's "Under Pressure." Collaborate is defined as "all processes wherein people work together —applying both to the work of individuals as well as larger collectives and societies." So... he wanted us to work together at... listening. Or stopping. Man, I wish he would tell us about his new invention! Unfortunately, something grabbed him and he lost his focus. Still, all these years later, I wonder what he had invented. Maybe it was a toaster that would butter your bread for you! Or, perhaps it was a new kind of teddy bear that could monitor your child's temperature and tell you if he/she got sick. Maybe it was a rotary dial phone that could also be used as a floatation device. Harpoon: is a long spear-like instrument used in fishing to catch fish or other aquatic animals. Usually thrown in a fast, rough motion. I'm starting to think Vanilla is stupid. Maybe his invention was a stick figure made of pipe cleaners. To recap, he doesn't know when he will stop. On the other hand, he does have a condition that causes him to GLOW IN THE DARK. This could be from some kind of radiation. If the movies have taught me anything, it's that radiation either turns you into a superhero, or kills you. So, sadly, maybe he will stop soon. Or he may be the next Green Lantern. Good lord, the man is trying to kill us all! Now, the Green Lantern I know would never act that way! To recap, his rhymes are both dope and deadly. However, when they do not succeed in being the best they can be punishable by forfeiture of land or goods and by possible loss of life or a bodily part under early English law. He then says "love it or leave it" and "you better gain way." He never explains why, so I will assume he was reading bumper stickers or something. He also tells us that we "better hit the bull's eye," but that kids aren't allowed to play. Then he offers to solve problems. I can hope that he starts by finding something to keep the kids occupied, since they won't be playing. Look, I didn't transcribe the lyrics here, so it is possible that he didn't say "the Vegas are pumpin'." If not, that is one of the most asinine things I have ever read. This is true. I saw him on the "Surreal Life." Someone hit a cymbal behind him and he began washing his hands repeatedly. Come to think of it, the cymbal actually seemed to trigger OCDs more than actual insanity. Less than the bikini? What would you call that? The monokini? Or the kini? He really switched gears on us there, didn't he? Now after launching an extremely dull monologue that gives us a peek into a day in life of ice, he goes to the chorus. By the way, if we learn nothing else, we should remember to always "get away before the jackers jack." OH MY GOD! He actually rhymed "poet" with "didn't know it." I thought you had to be someone "cool" aunt to make that rhyme! Remember, a chemical spill is a bad thing. And if music was a drug, he'd still have to rip off Queen. Check out the hook while the DJ revolves it. Oh! It's finished. Good thing, suddenly I want to go home and kick my juice. I find a whole bunch of strange things at the dollar store. I have found bad action figures, weird brands of toothpaste and even a book bag. Well, I guess the book bag wasn't that weird. It was just a good deal. 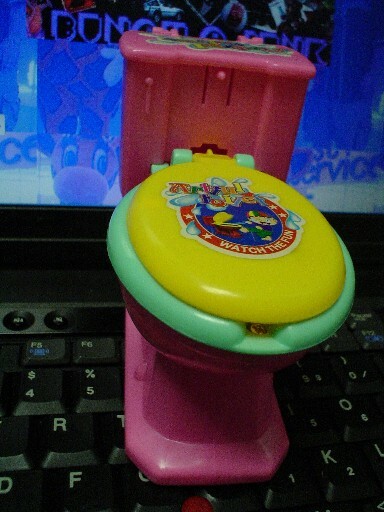 Anyhoo, I have found the strangest of them all: The Toy Toilet. 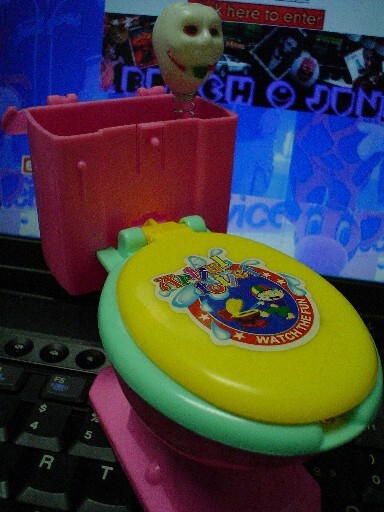 The whole concept of a toy toilet seemed strange to me. Why would someone want to play with something so... uh... IT'S A TOILET, DAMMIT! However, just being a child's plaything based the most revolting piece of furniture in your house would not be enough. This product is called "The Artful Close Stool." Oddly, "stool" is the only word with any relevance to the product. 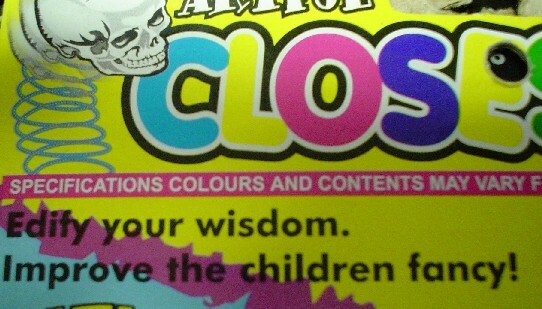 The packaging promises to "edify your wisdom" and "improve the children fancy." 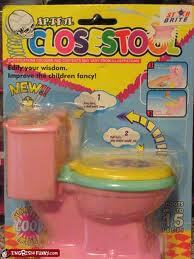 Oh yeah, a toy that isn't a toilet. Anyway, the Artful Close Stool promises to do 2 things. #1. If you open the tank a "skull would jump." They ain't kidding. Attached to a small spring is a little skull. Pop the tank open and the skull leaps out. Not the scariest skull ever, in fact, he looks a little like Johnathan Lipniki. Still, what purpose does this feature serve? Do we want to make kids scared to open the tank since that's where dad hides his drug money? I have no idea. The other feature is a little more obvious. #2. Open the lid "any water would jet." What they mean by that grammatical nightmare is that this toy is kind of a water gun and the lid is the trigger. It works and it's a relatively cool prank to pull on someone. However, it hardly shoots the "15 feet" that was promised. Maybe they just meant you should shoot it at 15 people's feet. That would improve the children's fancy in all of us. The Phillie Phanatic's birthday is always an exciting affair. Last year he arrived over the stadium in a helicopter dressed as "Super Phanatic." This year an all mascot game was scheduled for April 23, 2006. For a few days before the game the Phanatic made the rounds on the talk show circut. He seemed very excited to be playing a game with all his "mascot friends." So, it seemed a little suspicious when they announced before the game that it was going to be a surprise. The brought the Phanatic out to the field wearing a blindfold. Then they REMINDED us that the game was a "surprise" and told us to yell "SURPRISE" when they removed the blindfold. "He's blindfolded, not EAR-folded!" I shouted, not realizing how stupid that sounded. Phoebe Phanatic: The Phanatic's mom, representing the Philadelphia Phillies. Mr. Met: A man with a baseball head, representing the New York Mets. Lou Seal: A grey seal, representing the San Fransisco Giants. Gapper: A fuzzy red monster, representing the Cincinatti Reds. The Parrot: A green parrot with an oversized beak, representing the Pittsburgh Pirates. Slider: A bizzare purple and yellow monster, representing the Cleveland Indians. Wally: The green monster (named after the infamous Fenway outfield wall), representing the Boston Red Sox. TC: A bear, representing the Minnesota Twins. Slugerrrr: A buff crown-wearing lion, representing the Kansas City Royals. Each team was also joined by a bunch of kids. The Phanatic pitched for both teams. The American Leauge batted first. Every mascot that batted seemed to be thrown out. The kids, however, each hit a home run. One girl foul tipped the ball and somehow had the audacity to round the bases. Wally The Green Monster got a solid hit, but was called out when he left the playing feild to attack a man in a Yankee hat. After the man was down The Parrot joined in and the two pummeled him for so long it became a bit horrifying. Lou Seal was playing second base and at one point he stole second. Stole it and walked away with it. Slider mistook Mr. Met's head for the "actual" ball. So he hit him in the head with a bat and ran to first. Lucklilly the Phanatic grabbed Mr. Met and dragged him to first where he tagged Slider out with his head. After the American League scored 4 runs and recorded 5 outs (by my count) it was time for the National League to bat. Once again the kids got home runs and the mascots were out. Almost every play involved at least one mascot tripping over another mascot. Gapper stepped to the plate and, rather than hit the ball, caught it. He tried to run it for a touchdown, but was tackled on the first base line. The Phanatic's Mom got up to bat as the annoucers reminded us how "competitive" the Phanatic was on the mound. As if to prove that, the Phanatic intentionally beaned his mom. A furious Phoebe Phanatic stormed the mound, but was restrained. After all the National Leauge kids had scored thier home runs, and all the mascots were out the Phanatic asked if he could bat. He did, and he hit a homerun. Not a "legit" homer, but it was as legit as any of the ones the kids scored. Throughout the game the other mascots were on hand to entertain kids and pose for photos. Also at the game were the "Zooperstars" a bizzare group of inflatable mascots that danced and performed skits with the Phanatic. For a few days before the game the Phanatic made the rounds on the talk show circuit. He seemed very excited to be playing a game with all his "mascot friends." Lou Seal: A gray seal, representing the San Fransisco Giants. Gapper: A fuzzy red monster, representing the Cincinnati Reds. The Parrot: A green parrot with an over sized beak, representing the Pittsburgh Pirates. Slider: A bizarre purple and yellow monster, representing the Cleveland Indians. The American League batted first. Every mascot that batted seemed to be thrown out. The kids, however, each hit a home run. Wally The Green Monster got a solid hit, but was called out when he left the playing Field to attack a man in a Yankee hat. After the man was down The Parrot joined in and the two pummeled him for so long it became a bit horrifying. Slider mistook Mr. Met's head for the "actual" ball. So he hit him in the head with a bat and ran to first. Luckily the Phanatic grabbed Mr. Met and dragged him to first where he tagged Slider out with his head. The Phanatic's Mom got up to bat as the announcers reminded us how "competitive" the Phanatic was on the mound. As if to prove that, the Phanatic intentionally beaned his mom. A furious Phoebe Phanatic stormed the mound, but was restrained. After all the National League kids had scored their home runs, and all the mascots were out the Phanatic asked if he could bat. He did, and he hit a home run. Not a "legit" homer, but it was as legit as any of the ones the kids scored. Also at the game were the "Zooperstars" a bizarre group of inflatable mascots that danced and performed skits with the Phanatic. I promised myself a whole lot when I was a kid. So, I decided to grant Lil Sweetie one of his wishes. When I was a kid about 10 minutes of every grocery store visit was spent checking out the "cheap junk" machines. You know, the dime machines that dispensed cheap little toys that would only keep your attention for the car ride home. I would look at those machines from every side. I wanted to see the prizes I could get when I finally stuck my dime in. More often than not, I was disappointed with what I got. It was almost always some girls ring. The best I could do with it was pretend it was some kind of super handcuffs that Cobra developed to keep G.I. Joe locked up. As cool as that sounds, I wanted more. I wanted one of the good toys I saw in the machine. But, Mom's rule was usually one dime per visit. So, I promised myself that when I was grown up I would buy my own machine. Look at that majestic beauty! I bought it online from a vending machine company and it is fantastic. Sadly, they didn't have any that took dimes, so I opted for the quarter machine. Still, it holds the little dime prizes. I was able to get a few bags of those online as well. They have everything from mood rings and plastic spiders to little pencil erasers shaped like police cars. And it's in my living room. I even designed my own "product card"
Kimberly Williamson Butler wants to be Mayor of New Orleans. For some reason, the web designer chose not to put a photo of New Orleans on the front page, but rather, New Orleans Square in Disneyland. Because someone else pointed it out to me. But besides that, lets take a look at the photo. First, take a look at the trash can. Second, take a look at the people. A man and his lady casually walk down the middle of the street wearing a fruity Hawaiian shirt. No worries that a car might come around that blind corner in front of them and flatten them like a pancake. A pancake with no sense of style. Well, Kim lost. Not sure who she lost to but she ain't mayor. Still, she did bring a whole lot of attention to an area that really needed some attention. So, like Kimberly Williamson Butler I want to help the good people of New Orleans. Either way, I packed my bags and headed to New Orleans. I had a blast. I ate at the Blue Bayou, rode Pirates of the Caribbean and even pointed a few people in the direction of the nearest rest room. Why do people always ask for the "nearest rest room?" Do they assume that I would have told them where the furthest rest room is if they didn't specify? DUDE: Do you know where I can find a rest room? ME: Sure! My friend John has 3 in his parent's house. I recommend the one off the master bedroom. His dad always has great magazines, wink wink. DUDE: Is that the nearest rest room? ME: Oh hell no! That's a 6 hour flight from here. The nearest rest room is right behind me. You know, now I am starting to question calling it a "rest room" in the first place. You don't actually REST in there. Well, regardless they all thanked me for pointing them in the right direction. And I thank Kimberly Williamson Butler, for pointing ME in the right direction. In 1961 a theme park was built just outside of Nara, Japan. The park used Disneyland as a model. When I say "used Disneyland as a model" I don't mean they tried to make a SIMILAR park. I mean that they just ripped it off. You know when someone Xeroxes a photo, and then you make a Xerox of that Xerox? ...and the guy Xeroxing it was missing a few fingers. The resemblance is astonishing. Urban legends abound that Walt Disney was so upset by this park that he refused to build in Japan for the rest of his life. The Matterhorn is one of the coolest rides at Disneyland and one of only a handful that has not been replicated in another "Disney" park. It has been replicated in Dreamland. They also have a monorail. Looking at the monorail seems to confirm the rumors that Dreamland is a dump. The monorail sports a thin coat of yellow paint and a thicker coat of filth. Some older brochures seem to indicate that Dreamland was pretty nice looking back in 1961, but seems to have been neglected in more recent years. Wouldn't it be cool if Donald Duck had created this as a "bizzaro Disneyland" so he could compete with his rival Mickey Mouse? I wonder if the citizens of Nara ever visit Anaheim and say "Hey! This is a pale imitation of Dreamland." Of course, if they did they would do it in Japanese and I wouldn't understand them. In fact, I might think they were saying "Hey! Coy and Vance were a pale imitation of Bo and Luke." Millions of people visit Disney theme parks every year for many different reasons. Some come for amusement park thrills. Other come to spend time with family. Others go because of contractual obligations regarding the outcome of the Superbowl. I go for the Galactic Gobbler. I know, most of you probably don't know what a "Galactic Gobbler" is. Is it some kind of space rock? Is it the ACTUAL species clarification of McDonald's Grimace? Turkey legs are pretty common at the Disney parks. They are over-sized, salty and provide you with more meat than your average pet store dumpster. The turkey legs are usually sold at carts throughout the park. Frontierland is a pretty good place to find one in the Magic Kingdom or Disneyland Park, but they have them somewhere at most Disney parks. The Galactic Gobbler is the best of the bunch, however. It is available at the Launching Pad counter in Walt Disney World's Magic Kingdom. Yup, you gotta go to Tomorrowland to eat a hunk of turkey that makes you look like Fred Flintstone. I get one every single time I travel to Tomorrowland. But why do they call them Galactic Gobblers? After scrambling the letters for 74 straight hours I realized that, if rearranged, they spell "Bobcat Cellar gig." An extensive phone book search revealed two comedy clubs with the name "The Comedy Cellar." One, in Denver Colorado, did not hang up on me. Bobcat Goldwaith once had a show there. Yup, he had a "Cellar gig." The lady on the phone did not remember if his routine mentioned "turkey legs." However, subsequent calls to Disney were met with a "how did you get this phone number?" So I tried calling Bobcat Goldwaith. His number was unlisted, so I called up Carrot Top. We talked about turkey legs until the sun went down. Back in 2000 New York City was overrun with cows. Not real cows, but full size fiberglass ones that were painted in big silly colors. There were a whole lot of good ones: a Spiderman cow, a cow painted like a taxi cab and a Mr. T cow. Created by artist Ann Yzuel, the cow was an obvious ploy to get people to constantly ask her "Hey, didn't you make a Mr. T cow?" It sounds annoying, but it can't be as bad as hearing "Is that REALLY how you spell your last name?" The cow was sponsored by TV Land and was called "The Hay Team." Get it? Cows eat HAY! Mr. T was on the A-Team? Get it? Anyway, I do know that Mr. T was on hand for the re-dedication of the cow (it had been damaged and repaired) in mid-June 2000. I also know that the cow went on sale at Amazon.com's auctions for $1000 after the "Cow Parade" was finished. The cow (and dozens of others) did not sell on the first attempt. I don't know if it ever did. I personally wanted to buy it and the one thousand dollar price tag seemed low enough for a giant cow. Still, I have no idea where I could have put a giant cow that weighed as much as a small car. Maybe Bart Simpson was right when he cautioned people not to "have a cow." They are just too much trouble. Welcome to the THIRD year anniversary of "junk" on the web. To celebrate we have some special features all week (kinda like last year.) My how time flies! Make sure to check back tommorow. I will be posting comments all week. Thanks again for stopping by for the past year!